I ran a little poll through my Instagram profile last week, asking my followers what item they’d like me to feature in my upcoming Three Ways to Wear. I gave them the choice of this plaid skirt, these kick flare jeans or this sheer dress. To my surprise the sheer dress won the vote! I guess I shouldn’t be too surprised as, despite it being a pretty tricky piece to style, it’s a trend that doesn’t seem to be going away any time soon so I can understand that you might want a few tips on how to wear it. You might be wondering why on earth would anyone want to wear a dress that’s see through, and I can understand that, it takes a little more thought to pull together an outfit since you have to consider coverage and warmth and, well, it’s see through! 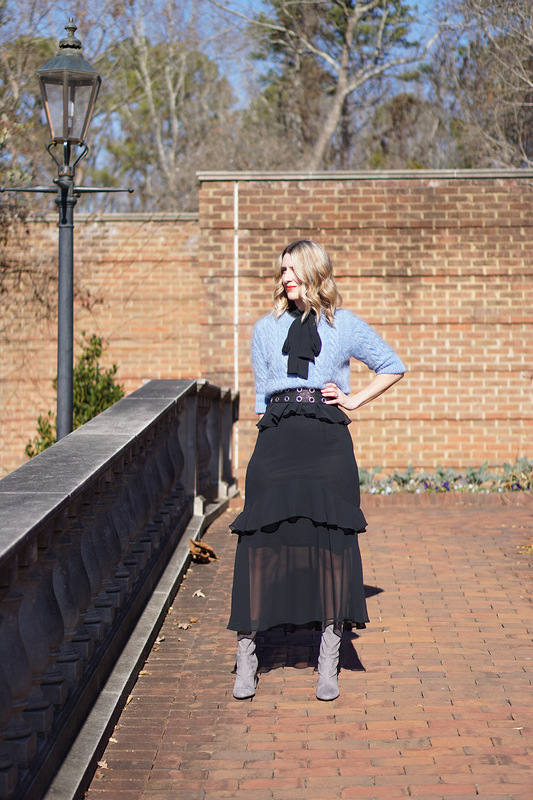 But, if you’re someone who likes to layer then sheer pieces make a great addition to your collection as they’re a great way to add depth and interest to a layered outfit, and are a fun item to use if you like to play around with proportions. They are a great way to add texture and interest to a monochromatic ensemble and great dress to choose if you want to show a little leg, but aren’t comfortable wearing a short dress. The sheer dress I’m featuring is this article is this one from Target, but there are many variations to choose from so if you’re looking to recreate any of these looks I’m sure you’ll find a style to suit you and your shape. And just in case you’re looking for a few ideas, I’ll share a few of my favorites at the bottom of this post. If you’re nervous about going for a completely sheer dress, there are plenty of other options. Some have solid panels like this one, and there are pretty print and embroidery options that will also give you a little more coverage. Consider the length of the slip you’re layering underneath. For the most flattering look, you’ll want it to end at a narrower point on your legs. This is generally just below the knee but everyone is different so choose a length that works best for you. When you’re trying sheer dresses on, don’t be tempted to quickly throw them on over your jeans in the fitting room (we’ve all done it, it’s the quickest way to try dresses on), especially if the dress has solid panels – as you’ll want to check that they are sitting in the right place and it will be pretty difficult to determine this if you’ve got jeans on. OK! On to my three looks! Wearing a sheer dress casually. I’ve become rather a fan of layering dresses over jeans for no other reason than I like how it looks, there’s something about combining a dressy piece with a casual item that makes me happy. I’ve pulled together similar looks here and here but never before with a sheer dress. A sheer dress adds a another dimension to the look that’s fun and quirky, but it also helps prevent the outfit from looking bulky. I chose to wear Vans with this outfit (a combination that I’m pretty sure my teenage self would have been a pretty big fan of 20 years ago) but I’ve also worn it with ankle boots and over knee boots, too. One point to note with a look like this is to make sure that the jeans you’re wearing underneath are longer than the dress, or can be seen, as if they can’t it can sometimes look like you’re only wearing tights and forgot to add the slip. I’m currently layering a light sweater underneath the dress, but in the summer I’ll swap this for a cami or cropped tee. A great way to maximize the wear of dresses is to layer knitwear over them. I prefer to wear cropped sweaters over my dresses as it’s the most flattering option for me but you might look great with a longer style, so adapt it to suit your shape. I think the key to the success of this outfit is the necktie on the dress which I decided to make a feature of rather than hide it under the sweater. In doing so I really feel it ties the whole outfit together. The belt serves two purposes, the first is that it highlights my waist and the second is it gives me something to tuck the sweater in to so it’s sitting at the correct length. I decided to go bare legged as I wanted to really highlight the sheerness of the fabric, but black tights would have worked, too. There are a number of ways to wear sheer dresses in the evening and they range from the bold and brave – wearing only your undergarments (and when I say undergarments, I don’t mean skimpy underwear, I’m talking high waist briefs and a good bandeau bra, to create a look that resembles something like this), to the more demure – layering a slip underneath, or a camisole and leggings. I chose the more demure option and layered a short slip under mine. There a were a few things I needed to take into consideration with this look; the first was how much flesh was I comfortable showing (obviously), and the second was how long to wear the slip underneath as if the length ended inline with a wider part of my legs, i.e right across my thighs, then it would be less flattering than if it ended at a narrower point, just below my thighs. I love to play around with different textures in my outfits so I chose to layer a short faux fur jacket over the top, but a leather jacket would look great, as would a more tailored style coat. So tell me, would you wear a sheer dress, or this one trend you’re going to be steering clear of?